Seven years ago, airlines – one in particular – were coming to blows with the OTAs. American pulled out of Orbitz and Expedia rallied behind its competitor and booted the carrier. I wrote our take on what was going on and where it was headed: Airlines vs. the World. 2015 was a watershed year. Expedia acquired Travelocity and Orbitz, effectively turning the U.S. market into a two-horse race. 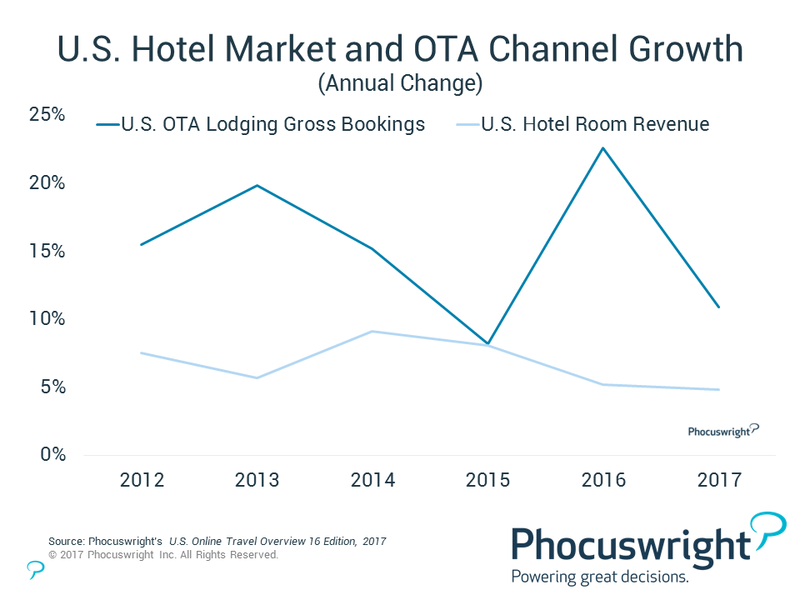 Between a hot mix of M&A and organic growth, Expedia Inc. and The Priceline Group (really Booking.com) combined accounted for nearly two thirds of OTA global gross bookings. Their combined share of the U.S. OTA market is well north of 90%. The OTAs are crushing it. They are growing much faster than the U.S. hotel market. In fact, 2016 was the first year when OTA lodging bookings in the U.S. exceeded total hotel website gross bookings. And they're growing even faster overseas in the more fragmented hotel markets of Europe, Asia and elsewhere. Such aggregation of demand among two major players means enormous leverage at the negotiating table. We've assembled an unmatched collection of influential industry executives and innovators. Hear from the leaders in online accommodation and how they are transforming travel across Europe, only at Phocuswright Europe starting tomorrow. The Seeds of Discontent. Hotels serve several masters, but chief among them are owners. All owners ask a fundamental question: Why affiliate with a brand? The answer, of course, is obvious: to bring in more demand and more revenue. The rapid growth of OTAs has many hotels rethinking those calculations. Why pay fees to the brands and still pay more commission to OTAs as their contribution grows? The cost of those campaigns is high. Owners as well as brands are footing the bill, and not all is quiet on the Western front. In addition, these programs will not fundamentally drive those coveted but less brand-loyal millennials into the loyalty fold. Millennials are price sensitive, favor choice and have a penchant for boutique and alternative accommodation experiences. In addition, the extreme price focus of these campaigns risks reducing the value of the loyalty program to price. We wonder what it changes in the hotel website vs. OTA competitive dynamic. OTAs are channels, but they are also marketplaces. The hotel market is fragmented. Hotels that do not compete aggressively on price risk being out done by competing hotels. What about the monopoly-duopoly assertion by the hotel lobby? It depends on how you define the marketplace. We at Phocuswright talk about OTAs as a marketplace from a strategic perspective, but not a legal one in terms of consumer choice. In the U.S., OTAs account for just 22% of hotel gross bookings, and even less if the lodging market is expansive enough to include rentals and the likes of Airbnb. (Hint: consumers already do.) Travelers have many options, online and off, besides Expedia and Priceline. OTAs don't set retail prices. A central tenet of a monopoly is the ability of the monopoly entity to set pricing. But it is the hotels that set pricing, based on their revenue management practices, competitive pricing strategies, forecasted demand, etc. OTAs may set commission and contracting terms, but not pricing. Hotel direct booking will grow, but so will OTAs, and independents and boutiques will continue to benefit. The key question is how long the chains and owners will hold out – and whether they can convert those new program members into long-term, higher-yielding brand loyalists. The big brands face a bigger threat – the fundamental shift in consumer accommodation choice. You've heard it all before: private accommodation, boutique hotels, authentic local experiences. Today's and tomorrow's travelers want something more, and the big brands of the future need to reinvent their portfolio today. Some are further along with this than others. And one more thing. In case you missed the latest earnings call from IAC/British Airways, the gauntlet has been thrown on distribution costs in the world of flights too. Lufthansa's bold experiment in distribution fees is taking hold, and it's likely other airlines will join. There have also been rumblings of U.S. carriers rethinking their distribution approaches as well. So buckle in. This is going to get interesting.